Essex recently donated $1,000 to the Lane Arts Council to provide funding for an Artist in Residence at Fairfield Elementary School. The Bethel Education Foundation and a school fund raiser added the matching $1,000 contribution needed to make this a reality. Essex constructed the school in 2015. "We were welcomed into this community, and we wanted to give something back" according to Ron Spencer, Essex Project Superintendent. The students had a great time contributing to this mural that will grace their school for years to come. Artist Steven Lopez was an amazing leader and cheerleader for this effort. "We can't thank Lane Arts Council enough for making this happen", says Jodi Sommers, Essex Marketing Manager. Here's what the local news organizations have to say: KVAL News and KEZI News. 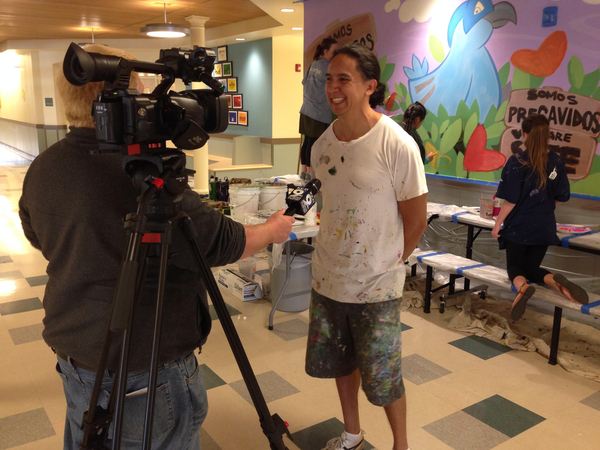 Artist Steven Lopez interviewed by the local news casters.